Commit to Fit Mayor’s Wellness Challenge Kicks off April 1st! The 2nd annual Commit to Fit! Mayor’s Wellness Challenge is a one-month health and wellness challenge that will be held from April 1st – April 30th, encouraging local Flint & Genesee County residents to practice healthy behaviors and become more involved in their community. Event Participation: Over 70 fun, healthy events will be held throughout Flint and Genesee County throughout the challenge, many of them led by Mayor Dayne Walling. All individuals and residents in attendance at each one of the fun, healthy activities will be entered into a drawing to win Commit to Fit! prizes. Online Challenge Tracking: Keep track of minutes of physical activity, servings of fruits and vegetables, and monitor weight online at www.commit2fit.com throughout the challenge – Achieve these healthy goals and become eligible for a number of incentives, including over $500 in total cash prizes! Visit www.commit2fit.com to view a complete list of prizes. A full calendar of events and additional details can be found at www.commit2fit.com or the Commit to Fit! Facebook page, and will include healthy cooking demonstrations at the Flint Farmers’ Market, a family fun walk at Max Brandon Park, a lacrosse clinic at Haskell Community Center and many more fun, healthy activities. The Commit to Fit! Mayor’s Wellness Challenge is supported by a diverse collection of partners, including the Greater Flint Health Coalition, Crim Fitness Foundation, the Flint Farmers’ Market, the Flint & Genesee County Parks, Hurley Medical Center, the National Kidney Foundation of Michigan, Insight Health & Fitness Center, Genesys Athletic Club, Jazzercise of Court Street, the Downtown Flint YMCA, and the University of Michigan – Flint Recreation Center. Sign up for the challenge at www.commit2fit.com today. All those who live or work in Flint and Genesee County are welcome to participate free-of-charge. Anyone who signs up by April 5th will be entered into a drawing to win cash prizes. Commit to Fit! is an ongoing initiative of the Greater Flint Health Coalition (GFHC) focused on improving the health and health behaviors of Genesee County’s residents. It is one component of the Greater Flint Health Coalition’s County Health Rankings Action Plan, an eight point action plan developed collaboratively by the GFHC that outlines a series of short and long-term strategies to improve Genesee County’s health. For more information on Commit to Fit! and the County Health Rankings Action Plan visit commit2fit.com. Established in 1996, the Greater Flint Health Coalition is a Flint, Michigan-based non-profit health coalition – a true partnership between Genesee County hospitals, physicians, business, insurers, public health professionals, policymakers, government leaders, educators, organized labor, community organizations, residents, and all those concerned about the well-being of our community and its residents. The two-fold mission of the Greater Flint Health Coalition is to improve the health status of Genesee County residents and the quality and cost-effectiveness of the health care delivery system in the community. For more information on the Greater Flint Health Coalition visit gfhc@flint.org. 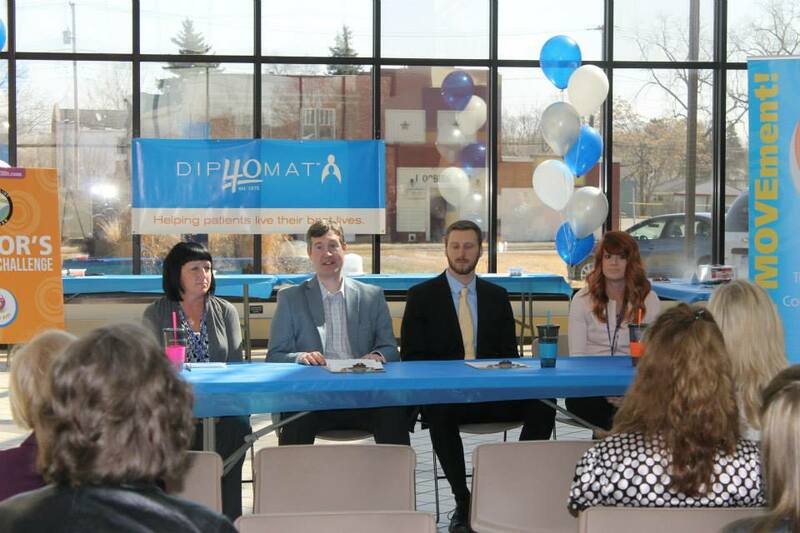 GENESEE COUNTY, MI (MARCH 13, 2015) – The 3rd annual Commit to Fit! College Challenge focuses on promoting physical activity in local colleges by giving students the chance to take part in a little “healthy competition” throughout the month of February. Taking home the Commit to Fit! 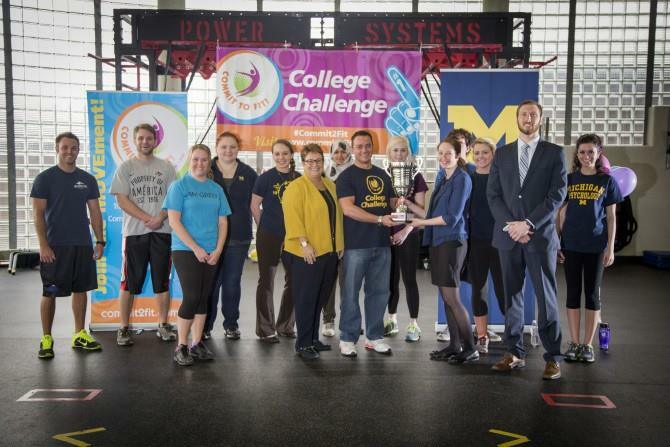 College Challenge trophy for 2015 are the students from the University of Michigan-Flint. Baker College of Flint, Mott Community College, and the University of Michigan-Flint students collectively logged over 156,000 minutes of activity on www.commit2fit.com. The University of Michigan-Flint students averaged 933 minutes of physical activity – which is equivalent to 33 minutes of activity per day! The Commit to Fit! College Challenge trophy will be presented to the University of Michigan-Flint students on Monday, March 16, 2015 at 11:30 a.m. at the University of Michigan-Flint Recreation Center. In addition to the trophy, students that logged over 840 minutes of physical activity were entered to win a variety of gift certificates to local businesses as well as cash prizes. Individual winners were announced Wednesday, March 4, 2015 on the Commit to Fit! Facebook page. The next Commit to Fit! Challenge, the Mayor’s Wellness Challenge will begin April 1, 2015 and will highlight a variety of free healthy events in the community. For more information visit commit2fit.com.